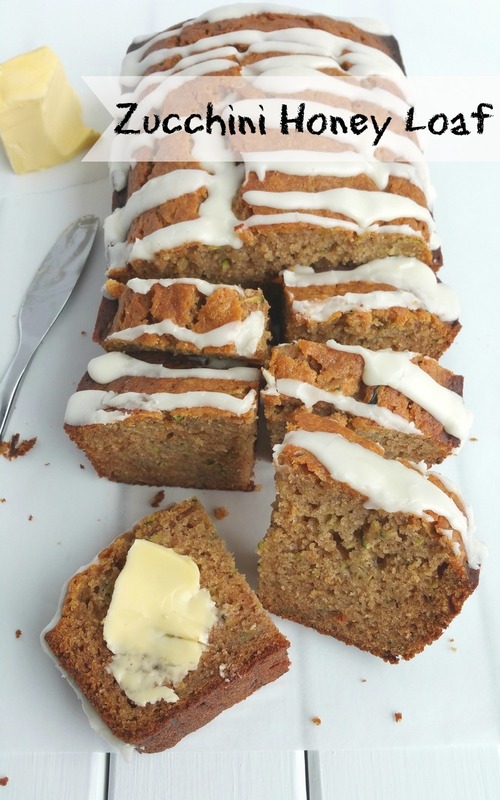 A slice of this Zucchini Honey Loaf is all you need in the afternoon to get you through the afternoon slump. It’s definitely the right choice with a cup of coffee or tea. Afternoons are always hardest when it comes to waiting for the next meal. We are all tired after a full day of activities and just need to keep our eyes open as we put the finishing touches on our daily projects. 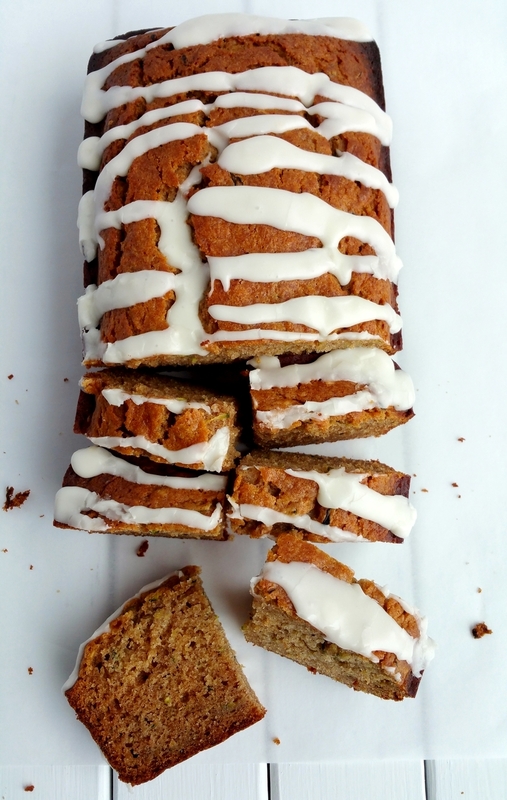 However, with a delicious slice of this Zucchini Honey Loaf, here’s betting you’ll have what it takes to make it over the hump. Let’s talk about afternoon snacking, how many of you can’t seem to control those cravings that show up everyday about 3 PM? The struggle is real! In the afternoon I need a little sweet treat to keep me motivated. I make a cup of black coffee (sometimes tea) and I grab something small, but always sweet. And there is nothing better than homemade baked goods. Some of my favorite things to have around for an afternoon craving are a slice of pound cake or one of my favorite cookies. I definitely don’t go overboard, but a small treat can go a long way. Once I’ve walked away from my office and indulged, I’m ready to come back and finish up those last, few tasks of the workday. 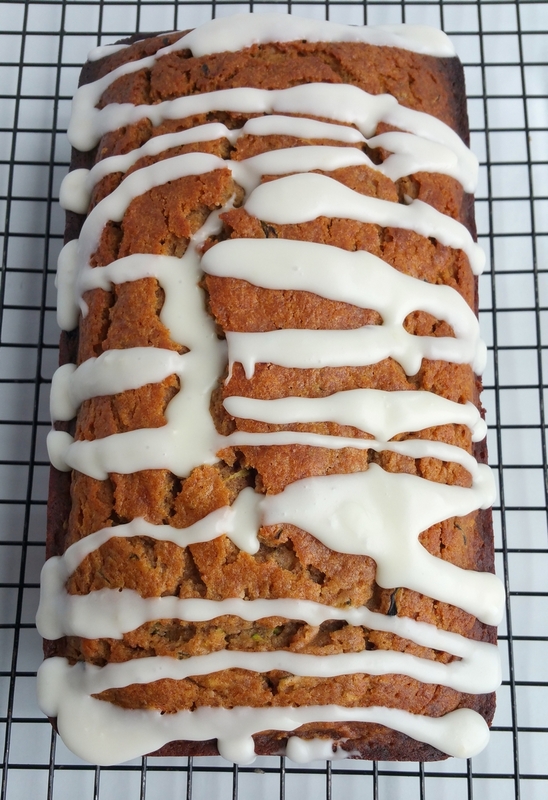 What’s nice about about this cake loaf is that it freezes well. I like to slice it and wrap each piece individually. The slices can be easily packed into a lunch box and will be perfectly thawed out by noon. 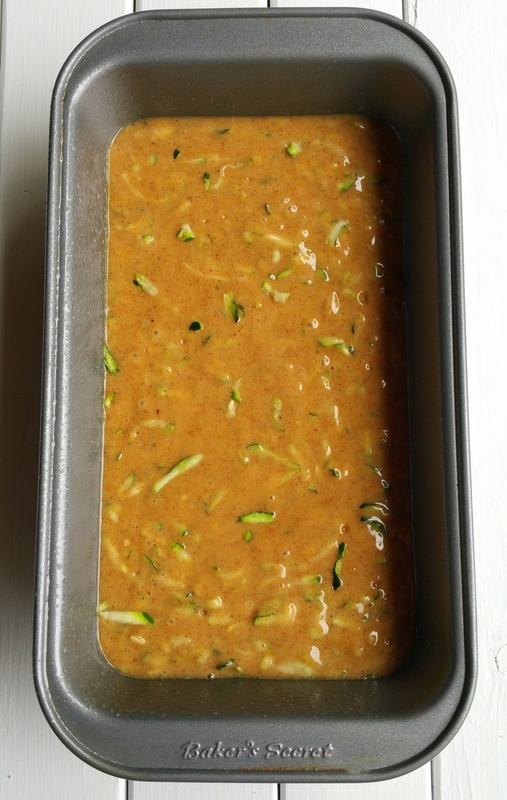 The batter fits nicely in a 9 x 5 loaf pan and as you can see there are lots of zucchini bits in this recipe. They do their job quite well when it comes to keeping this cake moist. You can easily not use a glaze on this loaf, it’s totally up to you. My family always prefers a glaze so here it is. A sprinkling of powdered sugar would also be perfect. Cutting them in bite-sized pieces means they are easy to grab when everyone walks in the kitchen. I always thought a smear of butter might be overkill on a slice of this cake. Turns out it’s not. Give it a try, I think you’ll like it. An afternoon snack does not have to be boring. Bake something once a week and enjoy it everyday. You definitely can’t go wrong with this Buttermilk-Walnut Snack Cake with Praline Frosting. And these Peanut Butter Chocolate Chip Oatmeal Energy Bites are sure to satisfy all the cravings. Cold Chocolate Snack Cake…I’m all about it. 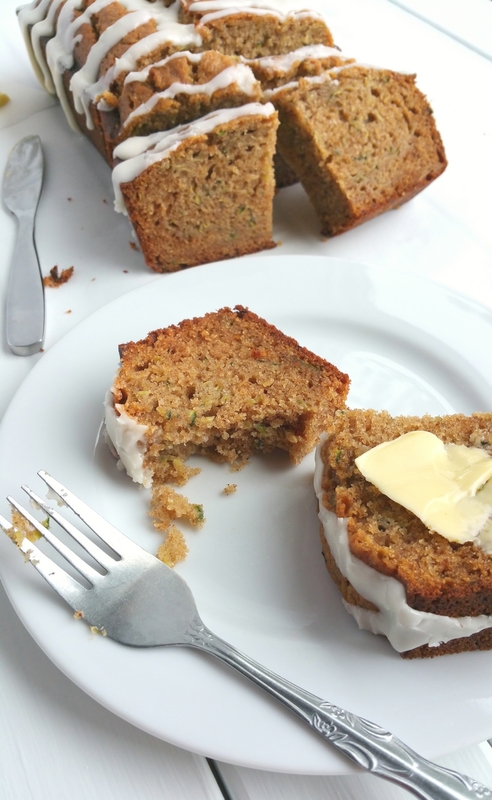 Almond Poppy Seed Loaf Cake is also at the top of my snacking list. Three years ago I shared my copycat recipe for Olive Garden’s Zuppa Toscana, have you made it yet? Five years ago this Mango and Papaya Pasta Salad with Creamy Lime Vinaigrette was all the rage at my potluck gatherings. Seven years ago this Vietnamese Style Beef became a favorite recipe in my house. Preheat oven to 350 degrees F. Spray a 9 x 5 loaf pan with cooking spray. In a large bowl, combine eggs, oil, honey and vanilla. Whisk until smooth. In another bowl, combine flour, baking powder, cinnamon, nutmeg, salt, baking soda. Add dry mixture into egg mixture and stir until just combined. Add zucchini and mix well. Pour batter into loaf pan and bake for an hour or until a toothpick inserted in the center comes out clean. Cool for 10 minutes on a wire rack before removing from the pan. 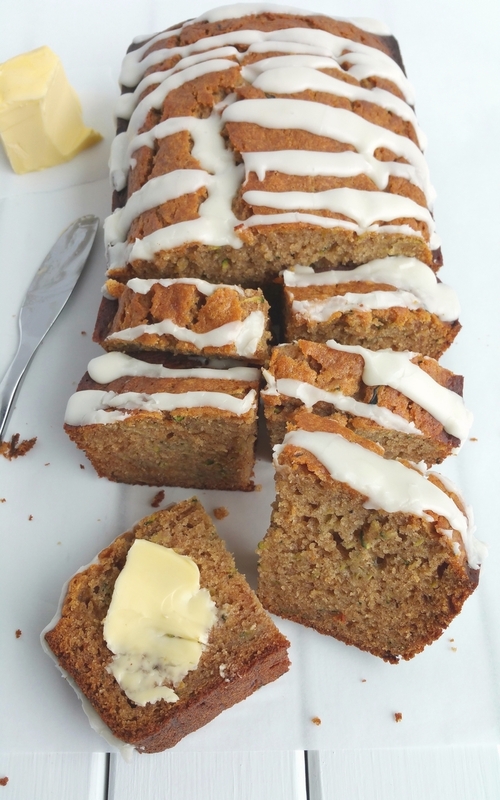 Once cake is completely cooled, make the glaze by combining all ingredients and drizzling over the top of the loaf cake. Slice and serve immediately or freeze. Will keep fresh on the counter in airtight container for several days.